Professor Sam Emaminejad has received the University of Waterloo’s Young Alumni Achievement Medal in recognition of his disruptive research into biological and chemical sensors that gather health-related data to diagnose and track diseases as well as his ongoing support of the next generation of engineers and scientists. “It’s remarkable that in the early stages of your career you’ve already bridged the long-standing gap between the Internet of Things and personalized medicine,” Dean Pearl Sullivan told him, when introducing Professor Emaminejad to the stage. 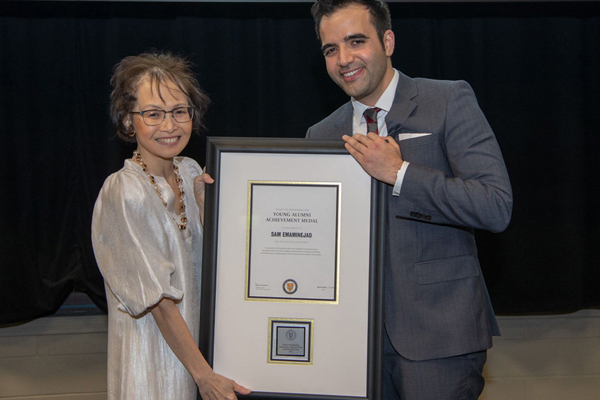 The Young Alumni Achievement Medal was established to provide tangible recognition of young University of Waterloo alumni who have distinguished themselves through their professional achievements, community service or academic excellence.